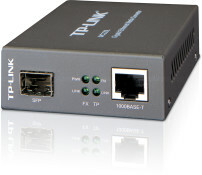 TP-Link Media Converters are reliable devices allowing to send Gigabit Ethernet signals on two single-mode fiber optic. 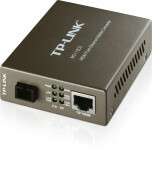 TP-Link devices have a built in MDI/MDI-X auto detection, in which case they don’t require usage of crossed cables. The devices setup transmission speed and transmission type automatically. Store and forward mechanism validates all data by checking the control sum. The media converters are fully compatible with IEEE 802.3, IEEE 802.3u, IEEE 802.3z standards. Plug and play makes installation and work easy. 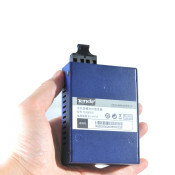 The LED informs about the converters current status. It’s important not to look directly to the fiber optics port while the device is plugged in, the light isn’t visible by human eye and can damage the retina. 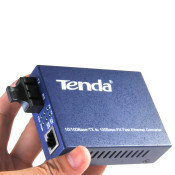 Why choose fiber optics technology? Fiber optics technology allows you to send the signal on large distances (for a 1550 nm wave length the attenuation is about 0,2 dB per kilometer, so the signal could be send to a distance of 200 km) with a lot data capacity. The signal is resistant to electromagnetic interference as well as atmospheric ones. The signal transmitted to a fiber optic cable cannot be intercepted so your and your clients data will be secured. 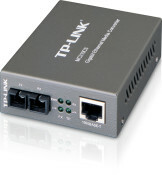 Media converters are widely used for creating residential LAN networks or diffused corporate buildings.